Most of the energy on this discussion will be spent on tomorrow evening into Monday morning's snowstorm, as this is obviously the highlight of the forecast. Highlights: Significant snow for at least part of the state later tomorrow until early Monday. Bitter cold to follow the storm for most of the week. The next storm system is slated to affect the region at the end of the week. Currently: The storm system that brought snow to the region this morning is now exiting stage right east of Nantucket. A new storm is organizing over the Southern Plains. That storm is our next snowstorm. Tonight: Will go a bit below most of the guidance for low temperatures tonight, due to fresh, but not super deep snowpack. In general, look for low temperatures from the low 20s in the outlying areas to around 30 in the metropolitan centers and the south coast. Tomorrow: Clouds increase from SW to NE rapidly during the day. Snow should arrive within a few hours of dinner time. 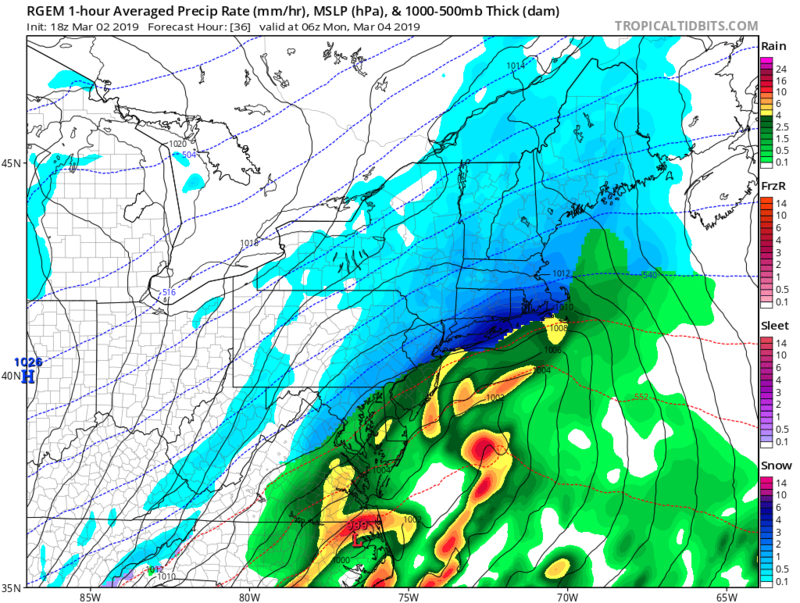 The snow could very briefly start as rain, depending on how warm we get during the day, especially along the south coast and in urban centers. High temperatures should range within a few degrees of 40, perhaps warmer along the south coast. Now for the storm... Here’s our forecast snowmap. In general, we are expecting 4 to 8 inches of snow across the majority of the state, with slightly lesser numbers in the NW hills. Now, as with any storm, these numbers are not set in stone. 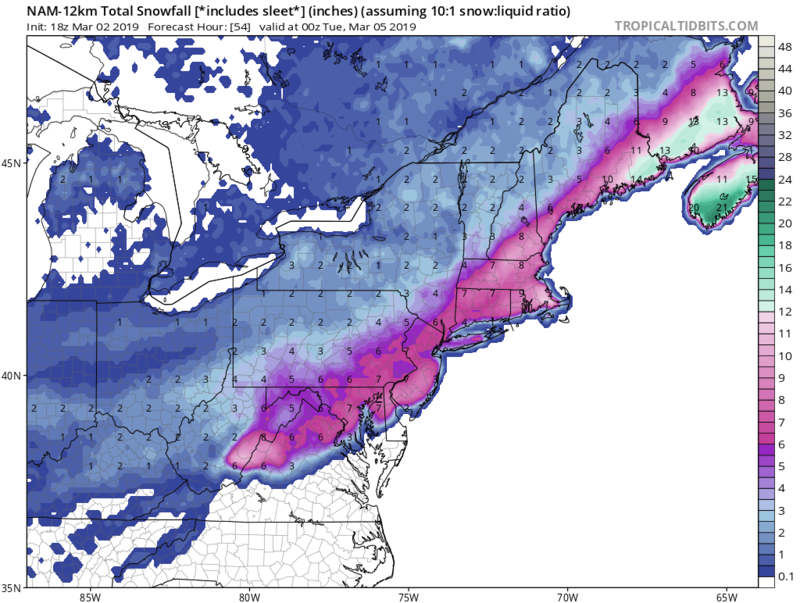 The forecast numbers are based mostly around the 12Z NAM, which is a good compromise between the ECMWF and GFS. 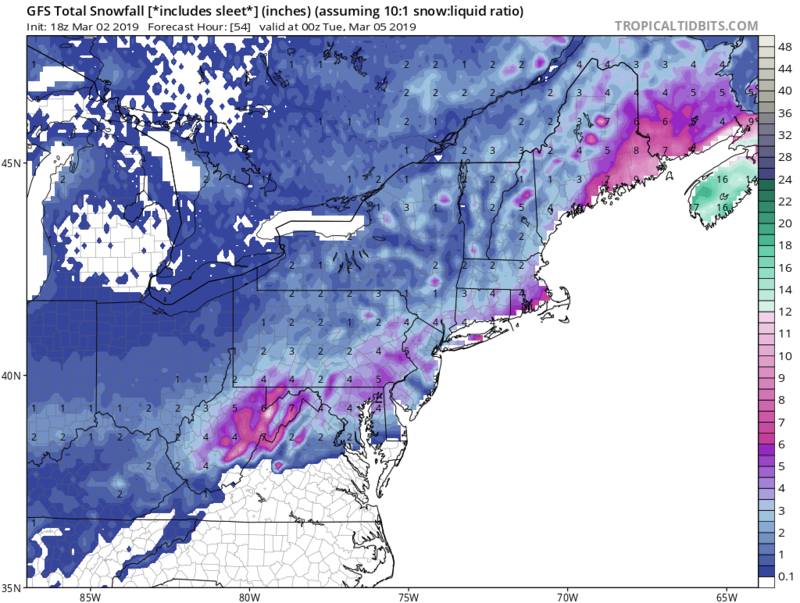 A slightly stronger storm, like the NAM or even stronger RGEM shows would produce higher snowfall numbers, especially in some areas. So while we have 4-8" on our map, it is possible that some areas may get more than that. For two reasons, we have opted not to go so high. 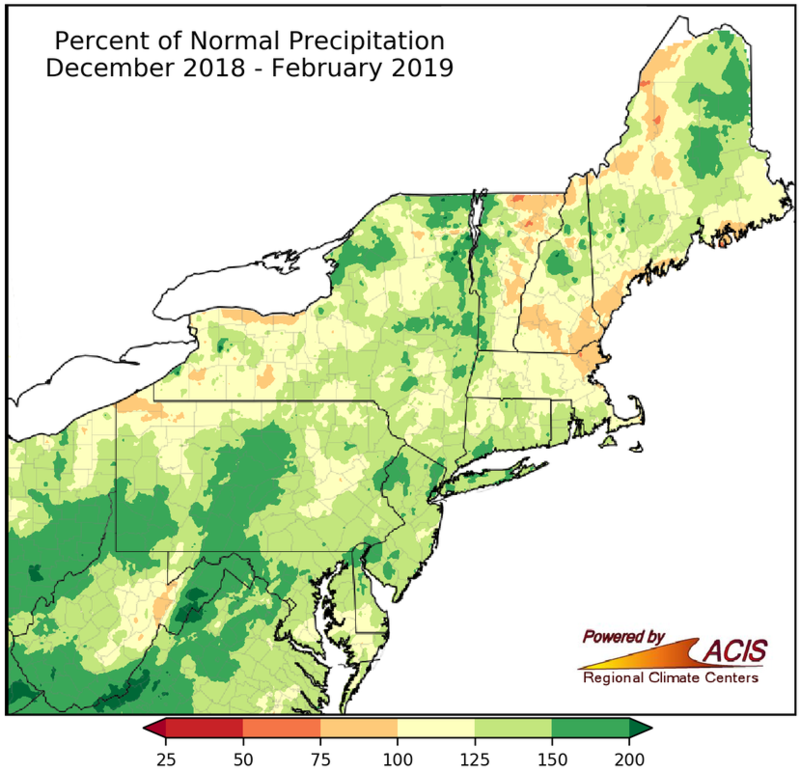 First, we do not have confidence in higher numbers being widespread, and secondly, those numbers could set up in banding anywhere across the region. A stronger storm would also raise numbers in the NW Hills more. 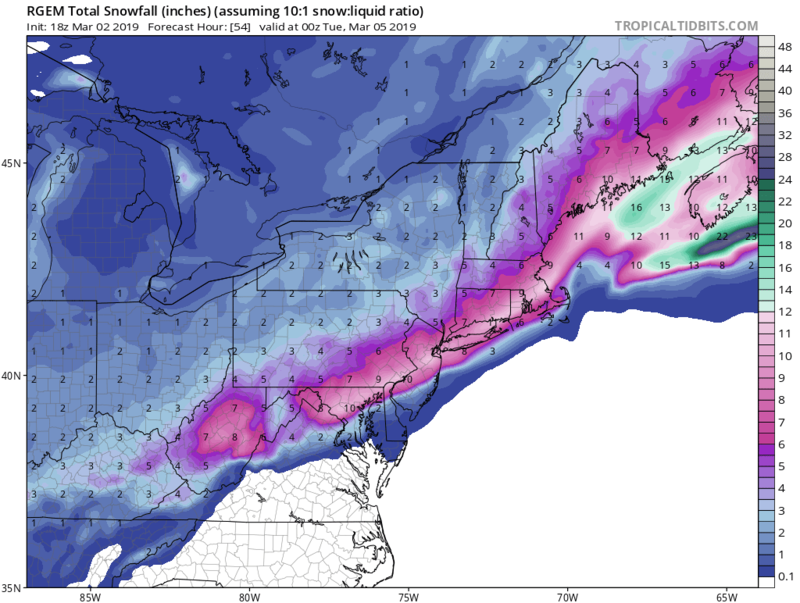 Now, a track further south like the GFS would probably keep similar numbers along the south coast, but lower numbers even further across the NW hills. A further north and west track would result in more snow for the NW hills, but introduce mixing issues along the south coast. 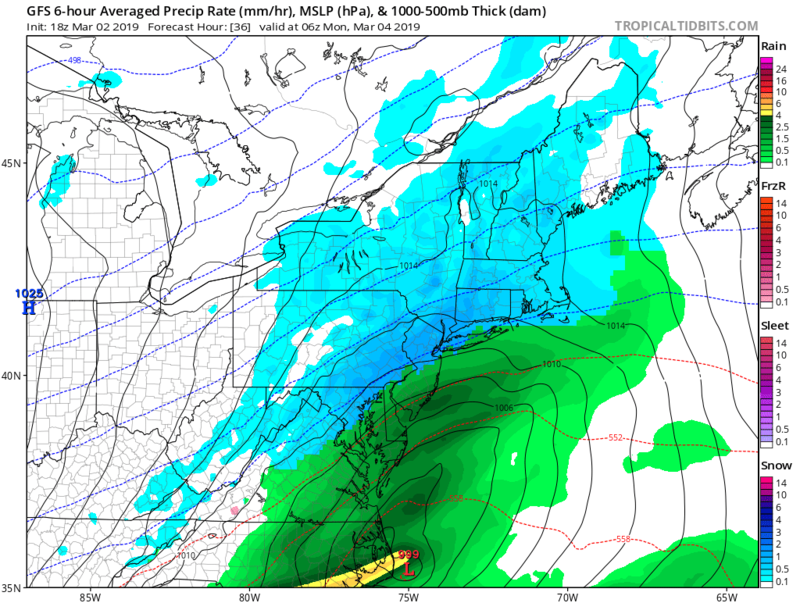 Here’s a look at the RGEM, NAM and GFS for late tomorrow evening as well as the total simulated snow amounts from each model (not perfect, but a good visual). Notice the track differences and the resulting impacts to snow totals. As far as potential mixing, right now the general feeling is that this is an all or mostly snow event for most of the state. However, a change to sleet is possible for a while along the SE coast. So all in all, the numbers we have posted are the best consensus for now, but changes are still possible tomorrow. 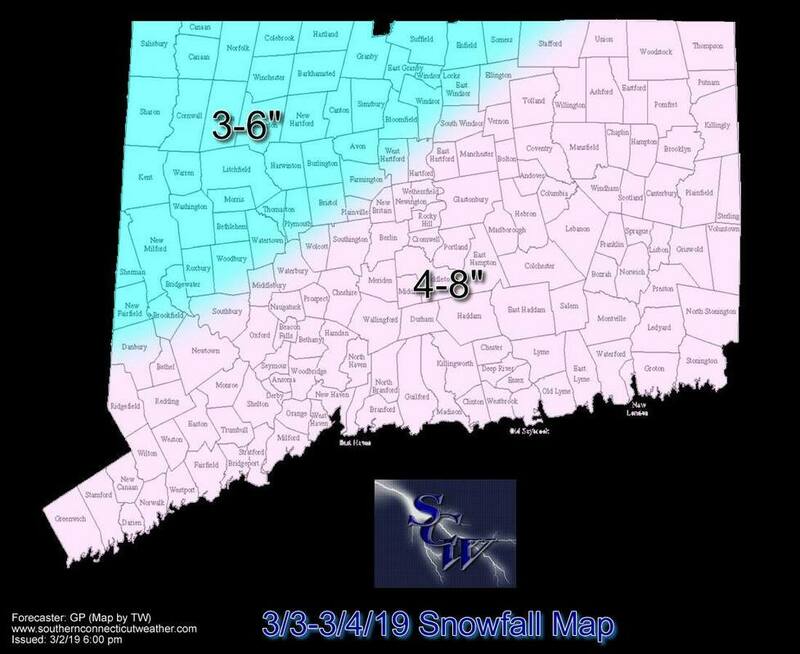 Depending on how things track, some possible changes include increasing (or decreasing) snow totals in the NW portion of the state (current 3-6” zone) and lowering totals due to mixing in the far SE (that would likely correspond with an increase in the NW). We’ll take a look at the overnight guidance in the morning and Tim will have the final call by around lunchtime. Temperatures will not be super cold during the storm and will likely rise into the lower 40s during the day on Monday. Therefore, some melting during the day. Temperatures Monday night will fall rapidly into the teens, allowing any standing water and slush to refreeze. Although we do have a long time during the day on Monday between when the snow stops and when temperatures drop, there is already snow on the ground from this morning's snow. When you add that to the snow that falls tomorrow night, there will be a lot of water in the ground. This will not all melt or dry in one day. So the final hazard from this storm will likely be refreezing of standing water and slush on surfaces and patchy black ice. Beyond that, the week looks very cold. Each morning should have lows in the teens, with maybe even a few single digits possible in the normally colder spots on Wednesday and Thursday mornings, On those two days, highs will struggle to get out of the 20s! There could also be some snow showers Tuesday and Wednesday afternoons. The shortwave for Tuesday night has trended a bit more potent in the latest model runs and could deposit a quick coating to an inch in the NW hills. It won't take much moisture to get a coating of snow in that air mass, given how cold it will be! In addition, winds will gust to 30-40 MPH at times, producing wind chills well below zero! It certainly will not feel like March! The next storm system will approach the area later Friday into Saturday. Given the fact that we have a significant storm slated to affect the area tomorrow, I did not pay much attention to this storm yet. 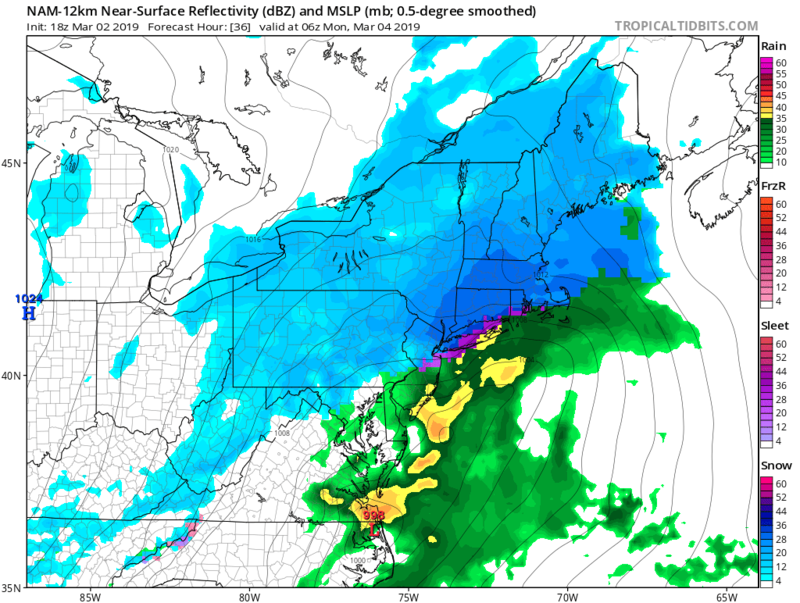 However, a cursory glance looks like this storm will probably be more like the ones we had back in February, where there are a lot of mixing issues, especially near the coast. However, it is a really long way out and six days earlier, the projected track of this morning's storm was only 1000 miles different than what verified. I'm not saying that that storm will be that much different, but I am giving an example of how much can change in six days. The further long range looks to feature a gradual warming trend, since it will be mid March by then and it's almost impossible not to warm from near record early March cold! However, I do not see any signs of true spring weather on the horizon, at least yet. And there probably will be more winter storm threats before we finally close the books on the winter of 2018-19. I want to thank my cohorts, SA and TW, for great coordination today with putting this package together.